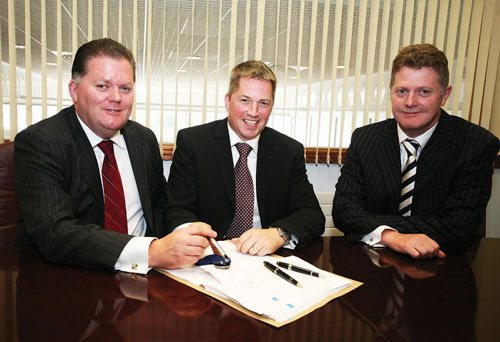 From left to right: David Hogan, chairman Tom Hogan Motors, John Lawlor, BMW network strategy manager and Paul Hogan (FCA), director Tom Hogan Motors, signing the official contract to become the newly appointed BMW & MINI dealer for Galway. Tom Hogan Motors has announced that its new BMW and Mini showroom located in Ballybrit, Galway is now open for business. Located next door to the existing Tom Hogan showroom, this new temporary BMW and Mini dealership is fully equipped to meet the high standards which BMW customers have come to expect. Tom Hogan Motors has more than 30 years’ experience in the car industry, having built its reputation on delivering exceptional levels of customer service across all its sales and aftersales departments and intends to continue this ethos through to the new BMW and Mini business. The new Tom Hogan BMW and Mini showroom facility will provide a full range of services from new and used car sales for both BMW and Mini, corporate sales, finance, as well as a fully equipped BMW and Mini authorised workshop for all aftersales requirements, including warranty. And from October 1 Tom Hogan Motors will be the only authorised BMW/Mini sales dealers in Galway city and county.